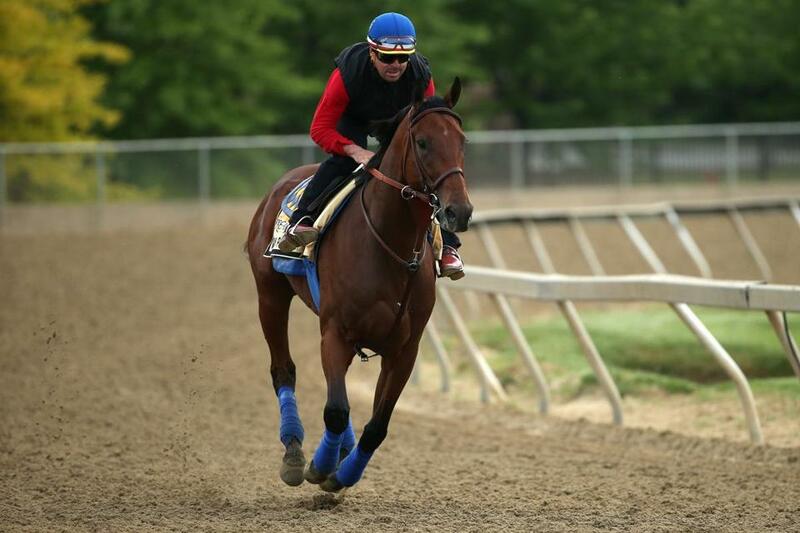 American Pharoah worked out on the Pimlico track Friday in preparation for Saturday’s Preakness. 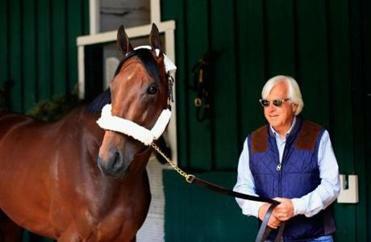 I’m feeling really confident about American Pharoah in the Preakness. The more I looked over the Kentucky Derby video, scanned the result chart, and heard about his workouts this week, the more confident I got in selecting him to win the Preakness. The outside post wasn’t a real detriment to him in the Derby; he came out of the gate well and jockey Victor Espinoza looked to get closer to the rail before the first turn. That’s when trouble happened. He bumped repeatedly with Mr. Z. He didn’t get the best position for the first turn, and the Brisnet past performances say he was five wide (the width of five horses from the rail). Despite finding a nice position down the backstretch, Espinoza wasn’t able to get American Pharoah to round the second turn cleanly. Brisnet again said he was five wide. That’s no way to win a race, but when Espinoza got him running straight in the homestretch, the Pharoah had enough talent and grit to surge past Firing Line. Espinoza also hit him with the whip some 30 times, which the jockey has been criticized for. Meanwhile, Dortmund set a reasonable pace without any obstacles but tired in the last 16th to finish third. Firing Line was running second off that pace, also without any problems, but wasn’t able to hold off the Pharoah. The Preakness has an eight-horse field, and although traffic problems are possible in any race, this shouldn’t be as difficult as the cluttered Derby. Now, about that No. 1 post. In the Derby, the No. 1 post is death. Horses can’t win from there. The great Andrew Beyer, America’s top horse racing writer, had a great piece Wednesday on this topic. In the Preakness, horses breaking from the first post have won only one of the last 28 runnings. However, in all Pimlico races this year contested at a mile and over, horses from the first post have won 24 percent of the time. I’ll go with the most recent stats and eliminate the post as a problem. The pace, as always, will be a factor. Firing Line, Dortmund, and American Pharoah should all be on or near the front, but there will be competition from some horses who did not run in the Derby. Bodhisattva is one. I’m not sure if the horse is named after the Steely Dan song or the Buddhist term for a person who has attained Enlightenment but postpones Nirvana to help others attain Enlightenment. But I know he was a front-running winner in the Federico Tesio at Pimlico April 18. Right now, I don’t think he’s fast enough to get the lead against the top horses. There’s also Divining Rod, who is owned by Lael Stable, the same people who owned 2006 Kentucky Derby winner Barbaro, the horse that was tragically injured in the Preakness and eventually succumbed. Divining Rod is also a front-running type who might be a factor in the pace and could affect the outcome. Espinoza’s job is to find the same type of spot he did in the Derby, placing his mount just behind the front-runners, maybe get off the rail a little bit so when he hits the homestretch he can come rolling down the middle of the track to head to the Belmont Stakes as a big favorite. In a smaller field with less traffic, I expect American Pharoah to improve in the Preakness and maybe win by a larger margin than he did in the Derby. 1 American Pharoah Victor Espinoza Bob Baffert 4-5 He won the Kentucky Derby in convincing style despite an extreme outside post, encountering interference and fanning wide on both turns; just might do better this time. 2 Dortmund Martin Garcia Bob Baffert 7-2 He led most of the way before finishing third in the Derby; really ran well, and that was his first loss; capable of reversing the decision. 3 Mr. Z Corey Nakatani D. Wayne Lukas 20-1 Finished 13th in the Derby and has only one lifetime win in 13 starts. 4 Danzig Moon Julien Leparoux Mark Casse 15-1 Decent fifth in Derby but still has only one victory, so he?s never won a race that included winners. 5 Tale of Verve Joel Rosario Dallas Stewart 30-1 He didn?t make the Derby field on points because he has only one lifetime victory. 6 Bodhisattva Trevor McCarthy Jose Corrales 20-1 He?s the local entry, as he won the Tesio at Pimlico on April 18. 7 Divining Rod Javier Castellano Arnaud Delacour 12-1 Owned by the same people who raced Barbaro, who was tragically injured in Preakness; won Lexington at Keeneland in last race. 8 Firing Line Gary Stevens Simon Callaghan 4-1 I overlooked him in the Derby and he was second best; he?s capable of another big race.